If you would like to make the cocktail featured in this episode we do recommend you try to find ingredients as similar as possible but with the understanding that the plum and vanilla liquor from Edinburgh Gin isn’t easy to find stateside. We did find that you can approximate this liquor by using equal parts plum wine and a vanilla spirit that is approximately 25% alcohol by volume. Below left is a shot of the battery operated fairy lights that fit inside an empty bottle. The batter compartment looks like a cork and we found that the batteries last for about 8 hours and can be replaced. Many of these are available online, just search for “bottle LED lights” and you will get several options. 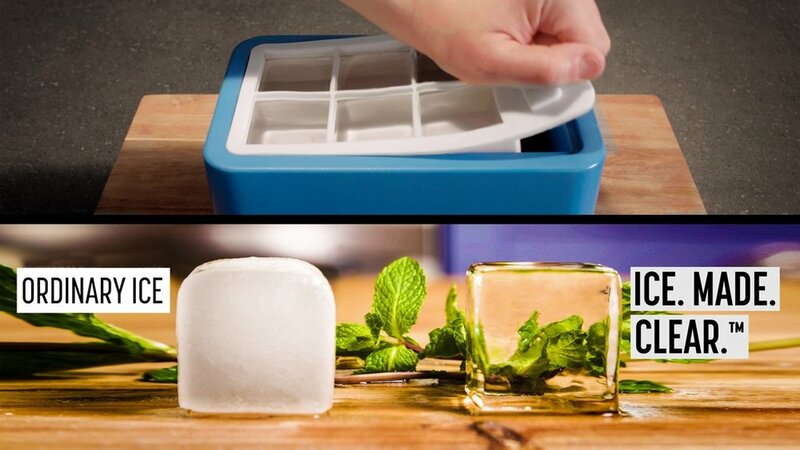 Below right is the Ice Made Clear ice maker. This was a kickstarter that Sunshine signed up fort a year ago and now we finally have our kit. Of all the clear ice makers we have tried this one is the best. One key is starting with warm/hot tap water to ensure the clearest ice. The kit comes with two molds and you can order other shapes later. THE January shirt from tiki bar t shirt club is a beauty. We love all our shirts, each one shows off an extinct tiki bar of the past. you may not be able to visit these locations anymore but you can remember them with these cool t’s. Get just the shirt you want or get a new one delivered each month. Each shirt comes with a story of the establishment. On February 2nd 2019 wristbands will go on sale for Tiki Caliente 11. The main hotel is sold out but you can still join the fun with a wristband and booking in a neighboring hotel. The crew of ZTL will be there helping organize the room crawl and hosting our own party on Friday night. The event is limited to just 600 people so that everyone has plenty of space and we keep a semi cozy feel. Pool, cocktails, music, art, symposiums, food and shenanigans for four days! Join us in May.